HDTV Supplys WolfPack UHD HDMI HDBaseT Extender over Single CAT5e/6 employs HDBaseT technology to route high-resolution HDMI signals with uncompressed HD 1080p and multi-channel audio over single CAT5e/6 cable from the source up to 220 feet to your HD display and 4K at 30 Hz to 120 feet. The WolfPack HDMI HDBaseT Extender is designed to convert an HDMI signal to a standard HDBaseT signal which can then be transmitted by LAN cable and also supports Transfer Bidirectional Infrared control signal together with the HDMI signal so you can control the Source at the Sink side which can be 220 feet away. It also you can control the Sink in the Source side. NOTE: HDTV Supplys implementation of the HDBaseT technology and this HDBaseT Extender adds virtually zero latency to the signal, less than 7 microseconds over 220 feet of CATx cable. At 100 feet you are talking about 3 microseconds. This means for example, in a church or auditorium, the speakers lips are in synch with the image on all the TVs and projectors. UTP termination follows the standard of TIA/EIA-568-B. Transfers an RS232 control signal together with the HDMI signal. POE Designed: By utilizing POE technology both HDMI audio and video signals and power can be sent to a device via standard Cat5e/6/6a cabling. This means you do not need to install a power outlet at the device location and you can use readily available, relatively low cost Ethernet cabling with this this HDMI HDBaseT Extender. It provisions full 3D (all formats) and resolutions up to UHD 4Kx2K (4 times the 1080p) with multi-channel audio, bi-directional IR and RS-232 extension. Fully compliant with HDCP, EDID and CEC controls. The HDMI HDBaseT Extender can be easily deployed with any third-party control system using the RS-232 control ports. With the built-in IR blaster, simply point the IR remote(s) at the display to control the Hi-Def. sources as if they were located in the same room as the display or vice versa. The HDMI HDBaseT Extender is designed for versatility and swift installation and is guaranteed to work with any HDMI source and display. Ideal for use with home-theater, digital signage, hospitality and medical imaging applications. 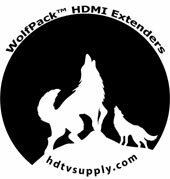 Why not buy this WolfPack HDMI HDBaseT Extender today? Supports 10-bit HDR streaming and up to 60 frames per second for UHD content. Why not buy this HDMI HDBaseT Extender today? Q: This HDMI HDBaseT Extender has CEC, what is CEC?